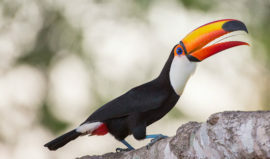 Brazil’s best wildlife is found in the Pantanal region, a huge wetland area that is best visited between late June and September (the local dry-season). 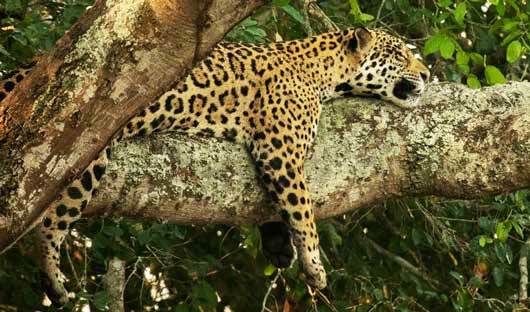 The dry forests found on the edge of the Pantanal afford additional wildlife viewing opportunities. The following is just a suggestion, we will create a customised Brazil itinerary just for you. You will be met at the airport by your guide for the transfer. After lunch in local restaurant your drive from Cuiabá starts with 100 km on asphalt (approximately 75 minutes) to the town of Poconé. These 100 km run through different types of tropical dry forest that go by the name of “cerrado” and “cerradão”. As you leave the south end of Poconé on your way into the Pantanal proper, you’ll notice the dry forests and fields drop-down into the large flat floodplain of the Pantanal proper. There are 122 bridges found along the well-known 145-km-long “Transpantaneira” raised dirt and gravel road. After 17 km you will encounter your first wooden bridges, often seeing herons, caimans, and Capybaras. The lodge is famous for its excellent mammal viewing, photographic opportunities from the two wildlife-viewing towers, water birds on the Pixaim River, and birding. Slow drives on the lodge’s private, 3-km-long entrance road often yield good views of species such as Marsh Deer and the 600-pound Brazilian Tapir (the largest land animal of South America). 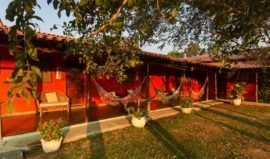 SouthWild Pantanal Lodge consists of one large, fully-screened living room/dining room with many overhead fans, outdoor sitting areas, and a library on Brazilian nature. The twelve screened guest rooms have a private bathroom with hot showers, overhead fans, air conditioning and one queen or two twin beds. Activities at the lodge are organized according to the current weather, logistics and your interests. One forest walk and one boat, vehicle or horse outing per day are included. 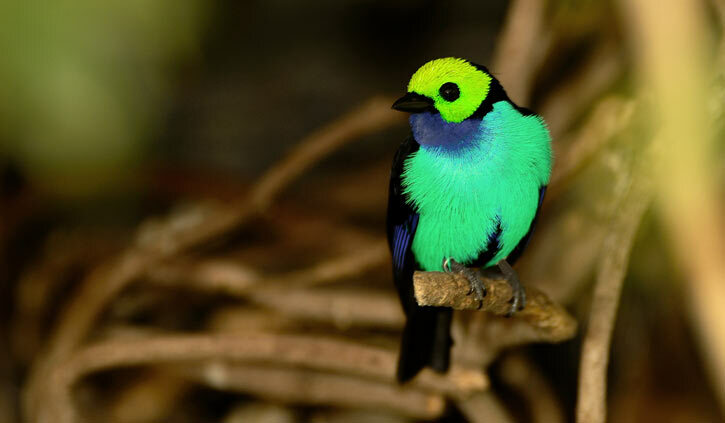 During your stay you should see hundreds of bird species (over 650 resident species and close to 1,000 including migrants), including Jabiru, Giant Otter, Capuchin monkeys, caiman and capybara to name the more common species. You have a choice of activities, all are optional, several are a short-walk from the Lodge. 1) Forest walk : 1-2 hour morning or afternoon walk in the forest and savannas not far from the lodge. Optional visit to the forest tower. Capuchin Monkeys are often seen in the forest. 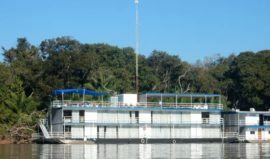 2) Boat ride: 2 hours morning or afternoon boat tour of the Rio Pixaim. 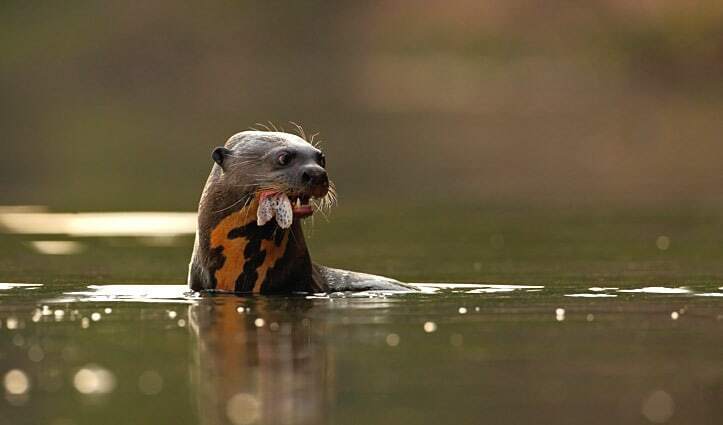 It is also one of the best sites for predictable viewing wild Giant Otters from a distance of only 1 to 5 metres away. 3) Horse riding: 2 hour horse ride through the ranch. 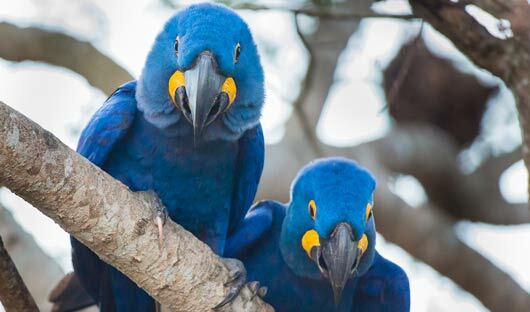 This offers a great opportunity to see the Pantanal from a more intimate perspective. 4) Spot lighting night-safari : 1 hour night time spot lighting safari on our open safari truck along the Transpantaneira Road and our long driveway (One night safari included per stay). 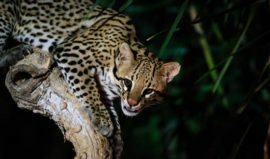 5) On most nights (6.00 pm to 11.30 pm) one or more habituated, wild Ocelots are visible from only 7-10 metres in good electric light (suitable for photography during). 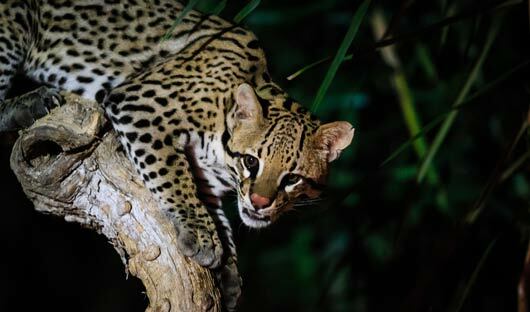 The cats appear at a forest location that is a 500-metre walk from SouthWild Pantanal Lodge. 6) A new TAPIR attraction is being unveiled at SouthWild in 2019. 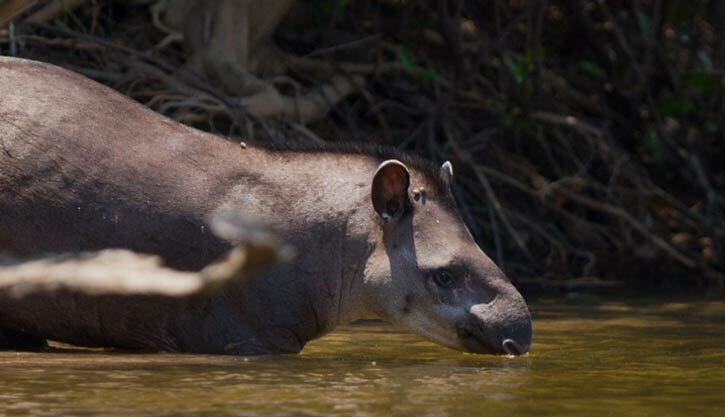 Brazilian Tapirs (at 250 kilos, the largest land animal in South America) are regularly appearing at a location 650 metres from the lodge; to forage for some fruit that we put out for them that allows for very natural photos in natural wild habitat. This Tapir Experience is the culmination of 22 years of testing and tweaking of Tapir viewing methods and systems that SouthWild scientists have directed in three different countries. 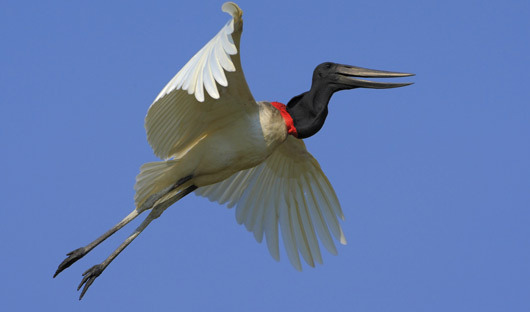 7) SouthWild Pantanal offers the free access to the Jabiru tower close to the lodge. It offers excellent photographic of these beautiful storks. During the hottest time of the day you can enjoy a dip in the pool or the browse through the significant number of nature books in the library. After breakfast you depart to drive 82 km to the end of the Transpantaneira Road at Porto Jofre. The type of vehicle used will depend on the logistical options and the weather; normally a (open topped) safari trucks. You’ll make frequent stops on the Transpantaneira in order to enjoy views of wildlife. The drive time varies according to what you see (approx 3 hours). 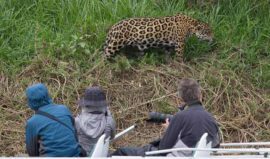 In Porto Jofre you board a Jaguar search boats to navigate the 17 km on the 100-200 metre wide Cuiaba River and then 28 km on the 70 metre wide Three Brothers River to Jaguar Retreat Lodge . Lunch will be served followed by a wildlife lecture (perhaps a short nap) and then at 2.00 pm, take a 4 hour boat outing on rivers of ‘Jaguarland’; an area that is home to at 65 Jaguars that have become habituated to the approach of motorboats and wildlife tourists. Return to Jaguar Retreat for dinner. 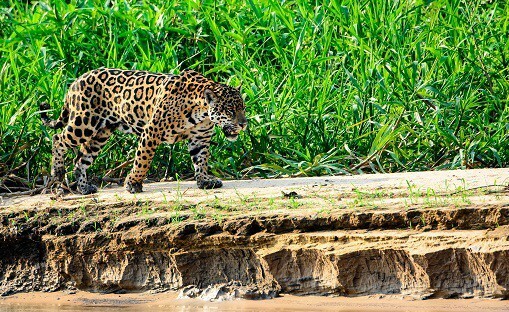 After an early breakfast you depart at 7.00 am you’ll navigate slowly at 25 km per hour (the ideal speed to detect Jaguars ) down 28 km of the Three Brothers River, before joining the the Cuiaba River (5km) and then 4 km up the 100 metre wide Piquiri River. After checking in lunch will be served (perhaps another nap). Then at 2pm you’ll begin a four-hour-long, afternoon boat outing. 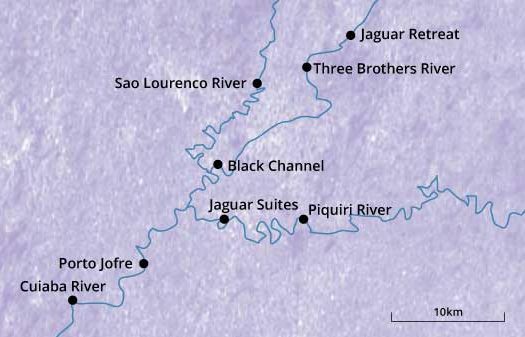 Searching for Jaguars & Giant Otters on the Three Brothers, Black Channel, Cuiabá and Piquiri rivers. On return to Jaguar Suites you’ll enjoy dinner followed by a science lecture. 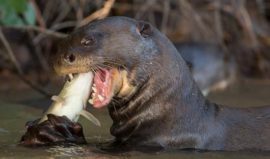 The next day will comprise of two four-hour boat outings as you continue your search and observation of Jaguars & Giant Otters on some of the same labyrinth of more than 100 km of river channels in this small (1%) area of the Pantanal. NOTE; additional nights can be added to increase chnace and sightings of Jaguar. The Jaguar Suites ‘ship’ features custom designed, spacious, (29 square metre) en-suite rooms. Each room has a massive floor to ceiling window (3.6 metres wide). Early breakfast and check-out from Jaguar Suites you’ll take another shorter boat trip in the surrounding area. At 8.30am boat transfer the 16 km downstream to Porto Jofre and then by road transfer to SouthWild Pantanal in time for lunch. 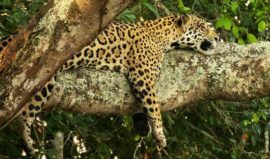 You’ll have time in the afternoon for another excursion and the option of a one-hour spotlighting truck safari, or maybe re-visit the Ocelot viewing hide or the Tapir Experience, both of which are described above. After breakfast at the lodge, check-out, and depart at 7.00-7:15 am to drive in closed, air-conditioned vehicle for 66 km of dirt road and then 105 km of asphalt road back to Cuiabá. The drive takes 3-4 hours, and the service ends as our guide helps you check in at the airport for your onward flight. 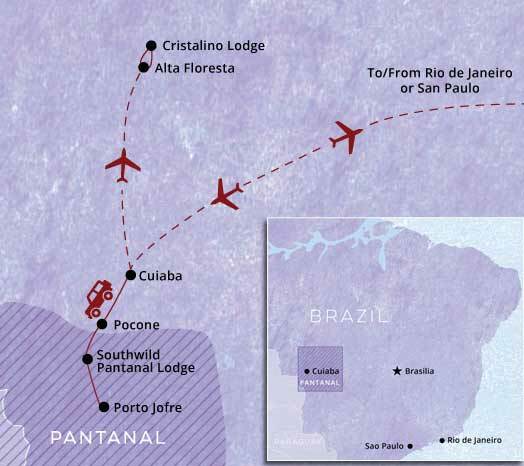 A short flight from Cuiaba to Alta Floresta will take you from the Pantanal to a dry-forest (as opposed to Rainforest). 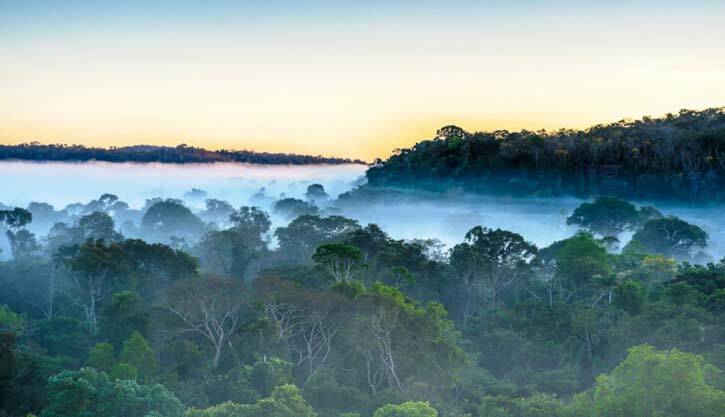 Cristalino Lodge is situated in the Cristalino Private Natural Heritage Reserve and is covered by primary and lush rainforests and provides a variety of natural habitats. There are trails of different kinds, taking you through forests and hills, plus canoeing and climbing the Observation Towers, during which you can look at the plants, birds and monkeys. The activities usually begin early in the morning, particularly if you are to watch the sunrise from the top of an Observation Tower. 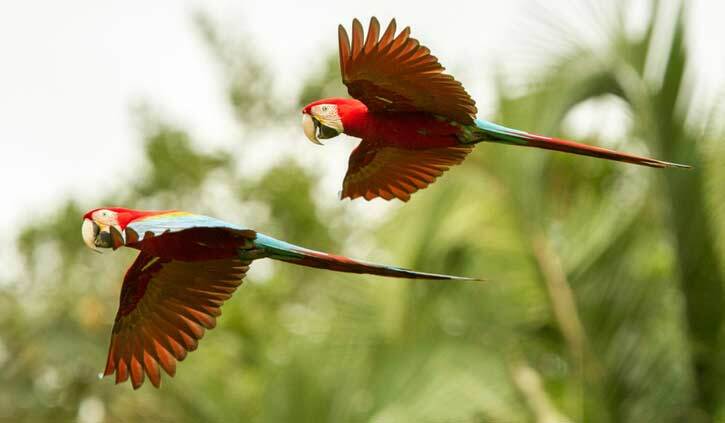 586 species of birds have been recorded in the area; including scarlet, blue-and-yellow, chestnut-fronted, red-and-green, blue-winged and red-bellied macaws. If you are interested in Forest wildlife – Cristalino is a must. There are many species of mammal in the reserve including Brazilian tapir, white lipped and collared peccary and capybara. 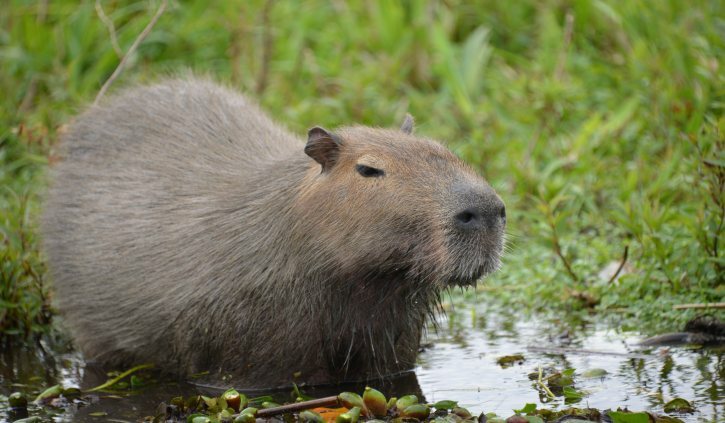 The tapir and capybara are attracted to water and are most commonly seen along the river banks in the period from July to October. Other mammals include the giant river otter and neotropical otter, which are excellent swimmers and hunters of fish. 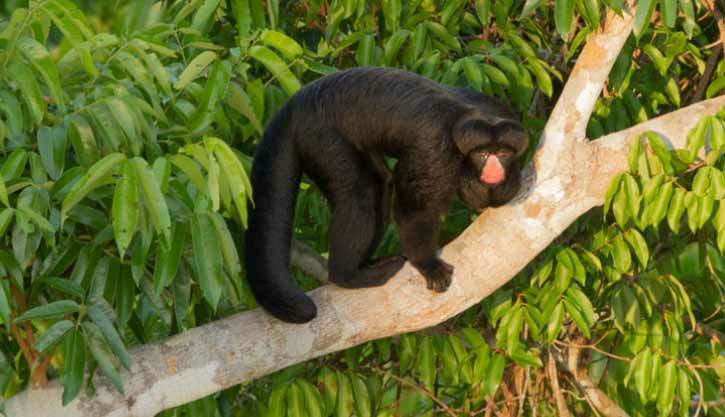 The forest is also inhabited by many species of monkeys, such as the endemic white-whiskered spider monkey, feline night monkey, capuchins, red-handed howler, red-nosed saki, the rare snethlage’s marmoset and orabassu titi monkey. 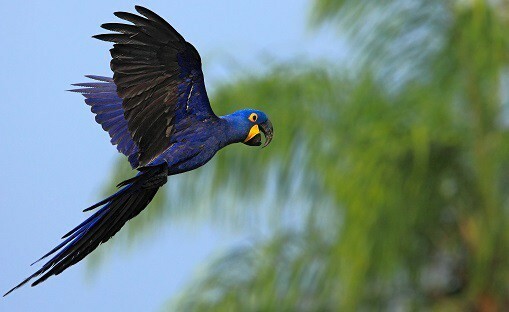 Of these, the capuchins, spider monkeys, sakis and howlers are commonly sighted. 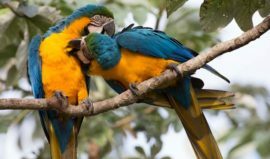 Other, less commonly sighted species include the collared anteater, giant anteater, tayra and shy three-toed and two-toed sloths. 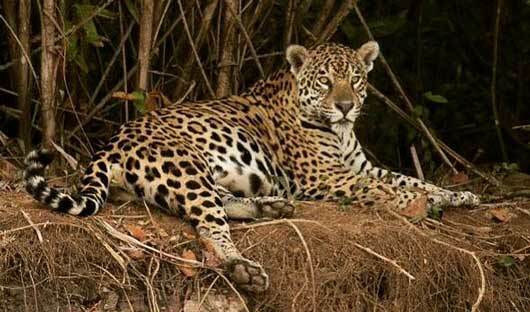 It is important to note that viewing animals in the Amazon is a challenging task, because of the forest environment. Many birds and animals can only be seen with the help of the telescope that the guides carry with them. 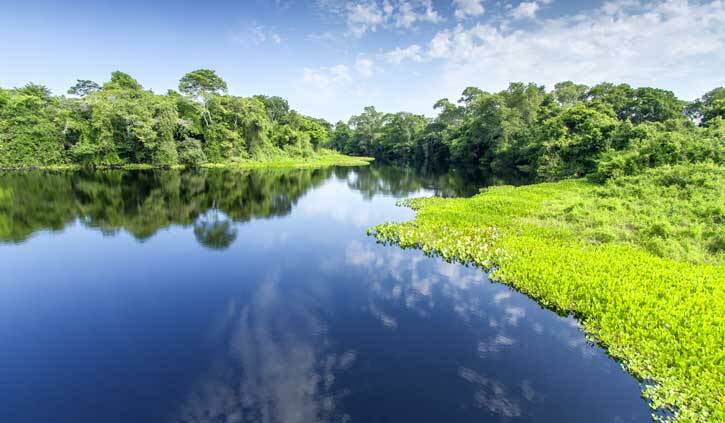 Nevertheless, the Cristalino region is one of the richest when compared to other parts of the Amazon due to the considerable variety of types of vegetation and terrain, thus making it common to see several different species on a single trip. It is also important that guests are prepared for the climate, which is hot and humid throughout most of the year. A four night stay, offering 3 full days, is the optimum period to stay at Cristalino. The lodge is very comfortable; the restaurant has stunning forest views. The self-service buffet style meals are an especially enjoyable feature of the Cristalino Lodge experience. The kitchen gives preference to local products that are in season. 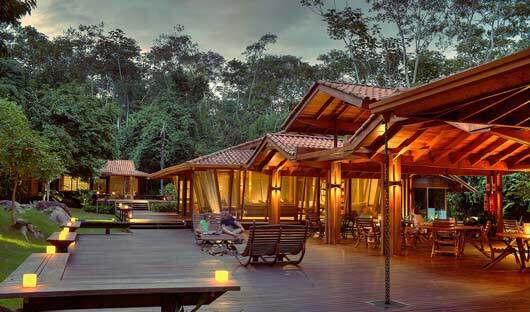 So you can look forward to delicious Brazilian cuisine accompanied by stunning views of the forest. Organically grown fruits and vegetables, fresh fish and a variety of meats can be enjoyed under indirect lighting and by candlelight in an unforgettable atmosphere. There are a variety of rooms offering comfortable beds, bathroom with a shower, ceiling fan, WiFi internet, armchairs, an additional outside shower in a private garden, and a veranda with a hammock.